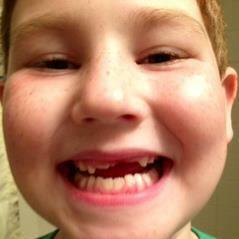 "I want to pray that my loose tooth will fall out." I just don't know if the boys are taking the prayer time seriously. I mean, every night they want to pray for the same thing…to have a good day at school; to lose a tooth; to have good dreams and sleep well…I feel they just repeat the same things over and over and don’t put much thought into it. These are the comments I made to Todd during our morning commute a few weeks ago. Have you ever had one of those moments when you speak your mind, and mid-sentence realize you're totally wrong? That never happens to me. Hmm. Yeah. Guilty. Sometimes I wonder if I'm teaching my boys, or if they're teaching me? Though they may pray for the same things every night, these are the things on their young minds. These are their worries and cares. If Facebook had a place to state one's faith status as they do relationship status, I'd probably fall under the “It's complicated” category. And, I'm the one making it complicated. "Let the children come to me. Don't stop them! For the Kingdom of Heaven belongs to those who are like these children." For the Kingdom of Heaven belongs to those who are like these children. Oh, to be more like a child...to have a faith that isn't complicated – a faith that believes God can do anything. A faith that doesn't question whether God is listening, or whether a request is too big, too small, or too mundane. A faith that relentlessly prays over and over and over again for the same thing, and trusts God hears and will provide. A faith...that prays "loose tooth prayers", and lays all worries and cares before the throne of Christ. Whether we're praying for teeth to fall out; for a marriage to be restored; for a good night's rest; for healing from sickness; for a great day at school; for a new job...He hears it all. And, He wants us to bring it all to Him. Over and over and over again. Even...our "loose tooth prayers". Father, thank You for allowing us to bring all our worries and cares before You. Thank You for listening and providing for us in the big and in the small things. May we, like children, have an uncomplicated faith– relentless and trusting in Your greatness and goodness. *I wish I could tell you that praying with our children is something Todd and I have always done, but to be completely honest, we didn't really get serious and intentional about it until the beginning of this year. Now, each evening before bed, Todd, the boys and I read a devotional from the children's version of Jesus Calling. After our reading, we each state something we are thankful for, share prayer requests, and pray together. It’s a wonderful way for us to close out our day and regroup as a family. It's also an amazing thing to watch your children grow in their faith and trust in the Lord...and to grow alongside them! If you are looking for a great devotional for your children, we highly recommend the children's version of Jesus Calling. If you have suggestions for other books, please leave a comment below. I'd love to hear from you!